Download wav-file or aiff-file (984K) from THE OFFICIAL JOHNNY CASH PAGE. 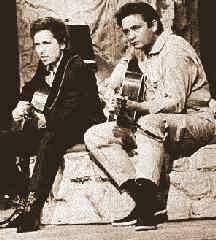 Covered by Dylan during Feb 18, 1969 Dylan-Cash Nashville sessions (duet with Johnny Cash), performed live with Paul Simon during their joint tour, Jun 1999. I wrote the song backstage one night in 1956 in Gladewater, Texas. I was newly married at the time, and I suppose I was laying out my pledge of devotion. Telephone interview, Nov 6, 1973; reprinted in Dorothy Horstman, Sing Your Heart Out, Country Boy, New York, 1976, p. 144. In the dressing room at Gladewater I was sitting with Carl Perkins, strumming on the guitar.... "This is an idea I got today," I want to write a song that has something to say. A song that will have a lot of meaning not only for me, but for everybody who hears it -- that says I'm going to be true not only to those who believe in me and depend on me, but to myself and to God -- a song that might give courage to others as well as myself." Carl said, "That's a good idea. What will you call it?" "I don't know," I said. "Something like 'I'm Still Being True' or 'I'm Walking the Line' or some such thing." "I Walk the Line would be a good title," Carl said. The song came easily. It was one of those rare times I felt a song was just "begging to be written." There was no wringing the mind or biting the pencil on I Walk the Line. The lyrics came as fast as I could write, and in twenty minutes I had it finished. Johnny Cash, Man in Black, Grand Rapids, MI, 1975, pp. 87-88. © 1956 Hilo Music, Inc. I keep you on my mind both day and night. You give me cause for love that I can't hide.